Narrative Style: First person, flashback framed at both ends by the present day. Synopsis: A middle aged man returns to his childhood home after a funeral. He ventures to the house down the lane and remembers long forgotten and sinister events from his childhood. The nameless narrator of this novel returns to the place where his childhood home used to be. Seemingly compelled to investigate, he starts down the lane to see if the farm and the “ocean” that used to be there still exist. Once there, he sits down by the pond and begins to remember Lettie Hempstock, the little girl who used to say that the pond was an ocean. With memories of Lettie, come memories of a chilling nature. Events start with the suicide of a man who has stolen money from his friends. This awakens a supernatural force which tries to give money to people. One of the most creepy parts of this book is when the nameless narrator wakes from a dream in which he is choking to discover he really has got a coin stuck in his throat. This really touched on one of my deeper fears. Events quickly take a fantastical turn, with monsters in human form and creatures from a realm beyond our understanding. The governess Ursula Monkton enthrals all except the narrator who sees her as the personification of evil especially as she seems to have a strong hold over his father. The narrator’s perception of her as a monster is like a child’s explanation of adult events that are beyond his understanding and the forgetting of these events as the child ages. The darkness in this story – personified by Ursula Monkton and the Hunger Birds – is pretty unsettling especially when the Hunger Birds start to eat away at the universe. But the images of friendship and sacrifice – personified by the Hempstock family – are equally powerful. I liked the idea that the universe is being protected from the worse of evil by three generations of strong women. Perhaps because this was the story of a young boy who didn’t entirely understand events all of the time anyway, there is never any room for disbelief. The story was utterly convincing. It transpires that the man has visited the farm a few times in his adult life although he cannot remember doing so. By the time he leaves the farmhouse, the reader realises that he will not remember this visit either. This made me think of the way that difficult childhood memories can have such a powerful hold even if you cannot remember them fully. Reading this was a little like reading a modern fairy tale. You could take it at face value, a scary story about death, friendship and sacrifice or you could look at it as an allegory about good and evil, childhood and growing up. 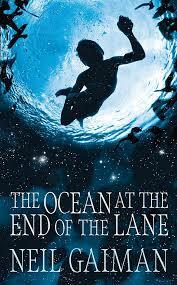 Like the pond, that was really an ocean, this is a novel with unexpected depth.